Something I once read about Trafalgar Square, the traditional center of London, mentions the “delightful pigeons.” But their sheer numbers dim the delight considerably, and I must admit that as I wade through them I often think of Tom Lehr’s song “Poisoning Pigeons in the Park.” Many know I have an irrational fear of chickens. Years ago at the Sandwich Fair in Illinois, Linda got a chicken rancher to surprise me by suddenly stuffing a live chicken under my arm. I blacked out on my feet, coming to when the thing started kicking, beads of sweat thick on my forehead. I lived and worked on farms in my youth, taking part in the hand-slaughtering of our meat—pigs and goats mostly—but no one could ever get me near a chicken. It’s the ultra clawiness of their feet, the way excess skin hangs pendant from their necks, or shaky, gelatinous combs rise on their heads. It’s their eyes, staring at you, alive and dead at the same time…. This fear radiates to all feathered things, even pigeons, especially when they turn from being merely annoying to frightening. It happens this way. Say I am walking down the Queen’s Flower Walk in Kensington Park. At one end 200 pigeons or more congregate and 50 yards into the walk someone behind me starts dropping bread crumbs. The pigeons take off. Because the Walk is so thickly lined with trees it forms a kind of wind tunnel down which they race, hundreds of them coming at me, flying from two to ten feet off the ground so they engulf me, whizzing within inches of my knees, my ears. I duck this way and that, a motion that probably makes it more likely that one will hit me some day. “They’re not bats, you know,” 14-year-old Richard Allen said to me, trying to advise me not to bob and weave so much. “They don’t have radar. They make mistakes.” That made matters worse. Every time I enter the Flower Walk I check behind me for anyone with a bag that looks like it might contain bread, an old person coming to pass time on one of the benches, for example, or maybe a young mother who’s just come with her child from feeding the ducks at the Round Water and has a few crusts left. If I spot them my pace quickens, or I give up the path altogether, or start whispering to myself, “Steady, steady,” as the pigeons fly head on at me. If I spot someone ahead of me with a bag of bread, it’s not nearly so bad. Pigeons flying up from behind still brush you with their wings, but at least you don’t have to look at them coming straight at you, their heads hunkered down between beating wings like they could care less what they hit. Streaming past me from behind, they make me feel positively three-D, like I’m part of a Sony Play Station video game. English Heritage puts up blue and white commemorative plaques marking the spots where famous artists or other culturally significant people lived or where significant cultural events took place. Mahatma Gandhi’s student digs are so marked, for example, as is the house where George Orwell lived, just around the corner from Vincent House on Portobello Road, a road which, every Saturday, hosts one of one of the biggest street markets in Europe. Early last month a bus taking us to Stonehenge stopped by a large row of Victorian houses. “Look,” said my colleague Patty Atwater, and pointed to a round blue and white plaque marking a home where Sir Alfred Hitchcock lived. The next day I realized where his inspiration for The Birds came from. Hitchcock had gotten about 50 or 60 yards up the Queen’s Flower Walk. Before him 300 pigeons milled. Suddenly someone behind him decided to get generous with bread. Engulfed in a wind stream of flapping, diving birds Hitchcock bobbed and weaved, throwing his arms frantically before his eyes in horror. No one will ever convince me otherwise. I’m finishing this sketch in early November. The skies are greyer and there’s more and more rain. Most people this time of year turn indoors, though I am looking forward to seeing fireworks on the Thames in the cold this weekend. It’s the Lord Mayor’s Show, a middle celebration placed just after effigies of Guy Fawkes have been burned all over London and just before the opening of Parliament, the place Guy Fawkes failed to blow up in the famous Gun Powder Plot. Where people are not, I am surprised to find, is indoors in all these magnificent churches, at least not for worship services. In late Summer they are in the parks, and in early Fall there are still flowers to wonder over. But now? Last week the Archbishop of Canterbury lamented that England was practically an atheist nation. They don’t “go to church,” nor does much of the rest of Europe, except mainly to be baptized, married, and buried, or at Christmas, maybe Easter. The United States seems to be the last church-going nation, certainly in the West. Patty Atwater’s research 30 years ago showed 67% of England’s population claiming membership in the Church of England, yet only 7% going to church regularly. There are signs of small revivals among youth, and I have met several devout people. One of the first things I was told at Vincent House was not to get on the wrong side of Marietta, the person who runs our dining hall. But she’s Filipino, like me, and tends to cut me some slack out of pure fellow feeling. Instead of going back home to the Philippines for the last two years she has taken pilgrimages, most recently to Medugorje where several children had a vision of the Virgin. She told me what had happened to each one of them. One had married a former Miss Massachusetts, the others have done this and that, but the one who’s remained unmarried still sees the Virgin almost every day! On the streets one day I heard two Ethiopian women, one who had a beautifully dressed little girl in tow, having this conversation: “Ah, the living God. He sleepeth not.” “No, no,” replied the other, “He’s not sleeping. No He’s not.” Yet a friend at Oxford says that in 30 years church attendance has risen only one per cent, now a measly eight. Which doesn’t mean the churches are totally empty. Around the corner from Vincent House is St. Sophia’s Greek Orthodox, all in all one of the most beautiful churches I’ve ever seen. On the Sunday I stopped in, it slowly filled up as I suspect some of the more “ethnic” churches still do. 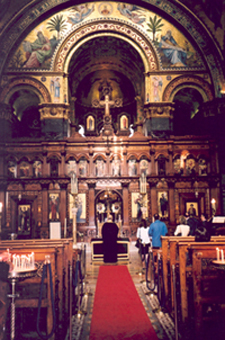 On the other hand, less than two blocks from St. Sophia’s is St. Thomas’, a Church of England church, large, vaulting, and, on the Sunday I dropped in, virtually deserted, perhaps 40 people knocking around its cavernous sanctuary. Even when my eldest son Rick and I attended a sung Eucharist at Westminster Abbey in early October, there were only about 200 there, and from all the backpacks and dangling cameras you could tell they, like us, were mostly tourists. Those who looked like local Londoners seemed to congregate in smaller patches here and there and numbered only a handful. At St. Martin’s in the Field, whose orchestra did the soundtrack for Amadeus, a small sign taped up near a door at the back of the sanctuary reads, “It costs 2 Lbs. a minute to keep this church open. Please give what you can.” Usually that giving comes in the form of buying tickets to the famous St. Martin’s concerts. Churches give tours, sell numerous gift-shop items, put on concerts, have cafe’s in their crypts, administer several kinds of social programs, so the people still come for these at least. The other night I saw a bizarre television program called Songs of Praise. While a choir, mostly of older people, sang fairly traditional praise hymns (“Lord of the Dance,” “Blessed Assurance”) dancers in slinky evening gowns, tuxes, ballet dresses, even cowboy hats swirled or line danced around a large sanctuary whose chairs had been removed to create a ball room. I was reminded how the English threw out the Puritans, but how Americans are still gripped by their asceticism, that Puritan fear of the flesh and the opulent world. At Vincent House I am regularly peppered with questions about the U.S., especially now with our election still in the surreal limbo of the precincts of Disney-World-land. Before the Gore-Bush race presented us such a grainy, indecipherable photo finish and I suddenly became an expert on every electoral point in the Constitution, James Rose, who sits at table #19, leaned over to table #17, as he does nearly every morning, with a can-you-explain-America question for me. 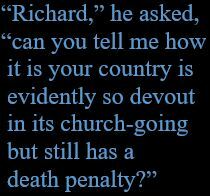 “Richard,” he asked a few days before the election, “can you tell me how it is that your country is evidently so devout in its church-going and still has a death penalty?” A great deal of anti-American sentiment gets stirred up in Europe over this issue, especially in Rome in this Jubilee year. I wish I could answer more clearly. The status of capital punishment debates and the Illinois moratorium is one area my son Rick works on as an assistant policy adviser in Governor Ryan’s office, so my answers usually lead towards this fact and peter out in various forms of fence-sitting. With some wonder and pride, I note that Governor Ryan is a hero over here for his moratorium. I said a moment ago that it’s rainier now, an understatement in the extreme. England is, in fact, experiencing the greatest wind gusts and flooding in over 50 years. Much of York is under water, and 33 rivers—including the Thames, the Ouse, and the Severn—threaten to overflow their banks. There has been a train crash at Hatfield killing four. Miles of suspect track are being replaced. That and the flooding and speed restrictions on trains nearly everywhere have thrown the rail system into near chaos. A few days ago flooding on the Piccadily Line shut off all tube service to Heathrow. A sullen mood grows, making you long all the more for the bursting flowers of late summer, the clear chill of mid-October. This weekend, despite the Lord Mayor’s Show, there will be an extra inwardness, possibly even a rise in church attendance. 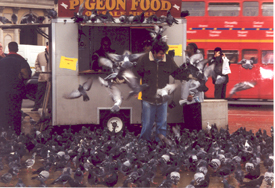 True, there are fewer pigeons flying at me because there are fewer scatterers of bread—but sometimes I detect a slight nostalgia even for that. Go to Lead Post in this series and see end for complete list of series items. This entry was posted in Diversity & Multiculturalism, Faith and tagged Alfred Hitchcock's "The Birds", church attendance in U.S. vs. England, death penalty moratorium, Gov. George Ryan, Guy Fawkes, Rick Guzman, Tom Lehr, Trafalgar Square, Westminster Abbey. Bookmark the permalink.